£30 Tax & Low Miles! Fall in love with the sweeping lines and sporty attitude of the Kia Rio, discover the economical nature and rugged styling of the Kia Sportage or test drive the Kia cee?d Sportswagon with its spacious interior and impressive specs. 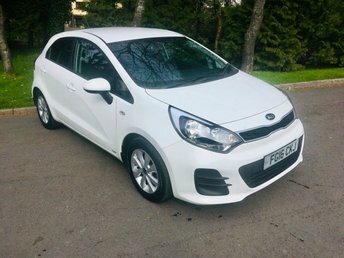 You'll find a superb range of used Kia cars for sale in Cargenbridge when you pay a visit to Parkdale Garage Ltd. We stock a wide selection of models to suit all budgets and all of our pre-owned cars are put through a thorough inspection process before arriving on the forecourt. Discover more by starting your search here on the website and contacting a member of the team in Cargenbridge for further information. Finance is available to UK residents aged 18 years or older, subject to status. Terms & Conditions apply. Indemnities may be required. Other finance offers may be available but cannot be used in conjunction with this offer. We work with a number of carefully selected credit providers who may be able to offer you finance for your purchase, commission may be received. We are only able to offer finance products from these providers. Postal Address: Parkdale Garage Ltd, Dalbeattie Road, Cargenbridge, Dumfries DG2 8LW. Find contact details here. Parkdale Garage Ltd is authorised and regulated by the Financial Conduct Authority, FRN: 724211. All finance is subject to status and income. Written Quotation on request. We act as a credit broker not a lender. We work with a number of carefully selected credit providers who may be able to offer you finance for your purchase. We are only able to offer finance products from these providers.